Spoiler alert: if you haven't seen the series finale of the television series "The Americans" you might want to stop reading here. Spoiler follows. Today's photo-of-the-day is from Moscow, Russia, and was taken on Sparrow Hills, "a hill on the right bank of the Moskva River and one of the highest points in Moscow." But that's not what makes this photo special. Sparrow Hills is the place where the final scene of "The Americans" was set. Phillip and Elizabeth Jennings had returned to the USSR in 1987 after two decades working as undercover spies in the USA. 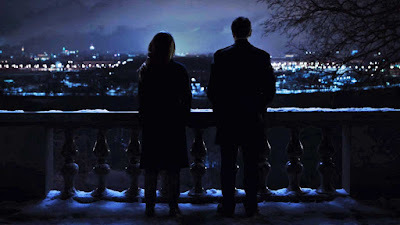 Upon arriving in Moscow, Sparrow Hills is where they asked their driver to stop so they could get out of the car and gaze over the city they had left long ago. Ellen stands where viewers last saw Phillip and Elizabeth stand in 1987. A screen shot from the series' final scene follows the jump.